THE FASTER THE WATER IS FLOWING, THE MORE SEDIMENT IT CAN CARRY. THE FASTER THE WATER IS FLOWING, THE LARGER THE SEDIMENTS IT CAN CARRY. The faster the water is flowing, the more material it can carry, and the bigger stuff it can move. Slow moving streams can only carry a little bit of very light material, but fast streams can carry a lot of stuff of varying weight. THE SPEED OF A RIVER IS EFFECTED BY THE GRADIENT AND SHAPE OF THE STREAM BED. STEEP RIVERS FLOW FASTER, AND NARROW RIVERS FLOW FASTER. The second factor in carrying capacity is stream discharge. DISCHARGE IS THE VOLUME OF WATER FLOWING PAST ONE POINT IN THE STREAM AT A GIVEN TIME. It is usually expressed in cubic meters per second. Streams with a high discharge move larger volumes and sizes of sediment, and low discharge streams move smaller volumes and sizes of sediment. 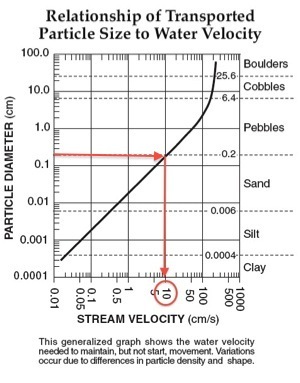 If we look in the Reference Table at the top right hand corner of page six we will see this graph (overhead) of Relationship of Transported Particle Size to Water Velocity. The Y axis of this graph shows us the particle diameter of the material in cm. The X axis shows us the stream velocity in cm/sec. The line shows us the relationship between the two. Other than these two basic things you should notice the dotted lines running across the graph. These lines differentiate between the names of the different sediment sizes. The largest sediment sizes are called boulders and they are anything that is larger than 25.6 cm in diameter. After that come cobbles which are anything between 6.4cm and 25.6 cm across. Sand is anything from .006 to .2cm in diameter. 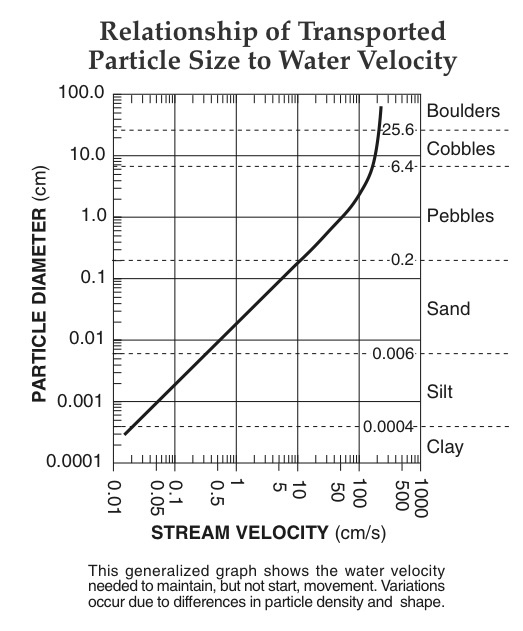 Silt ranges from .0004 to .006 cm, and clay is anything less than .0004 cm across. Lets Practice: How fast does a river have to flow to push a particle 0.2 cm in diameter? Start by going to the 0.2 cm line on the Y-axis. Cross straight over until you hit the curve. Drop straight down from the curve to find the velocity. Let's practice: What diameter of particle can be pushed by a river flowing 50 cm/sec. Start by going to the 50 cm/sec line on the X-axis. Move up until you hit ht curve. Cross to the left to find the particle size. Let's practice: What sized particles can be carried in a river flowing 5 cm/sec? Start by going to the 5 cm/sec line on the X-axis. Move up to the curve. Cross to the right to see what particle range you are in. Since the river can push sand, it must also be able to carry smaller particles like silt and clay. What Happens When A River Slows Down? As long as a river is moving fast, it can carry sediment. But when it slows down, the river cannot carry large particles anymore, so they drop to the ground. DEPOSITION OCCURS WHEN SEDIMENTS SINK TO THE BOTTOM OF A RIVER OR LAKE. THIS HAPPENS WHENEVER THE RIVER SLOWS DOWN. RUNNING WATER DEPOSITS SEDIMENT IN A HORIZONTALLY SORTED PATTERN FROM LARGEST TO SMALLEST. This pattern always occurs in running water, because as the river slows, it deposits the particles that are hardest to carry first. CALM WATER DEPOSITS SEDIMENT IN A VERTICALLY SORTED PATTERN WITH LARGEST ON BOTTOM AND SMALLEST ON TOP. When particles are deposited in calm water, the largest and heaviest objects sink the fastest. The result is that calm water deposits sediment in a vertically sorted pattern with largest on bottom and smallest on top.